The Township of Marple and the Broomall Rotary Club are proud to announce our Hometown Heroes Banner Program. This program serves as a tribute to recognize the men and women with a connection to Marple Township who have served or are serving our country in any branch of the United States Armed Forces. 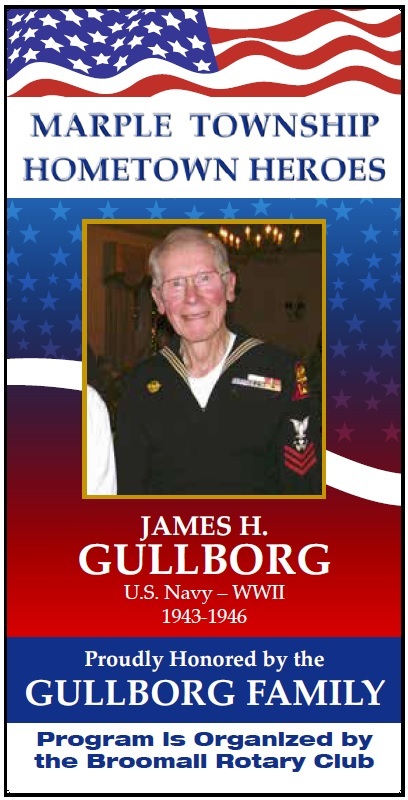 Each individual banner is unique and will include the veteran’s picture, branch of service, era of service and sponsor’s name. The banners will be located on the major roads throughout Marple Township. The banners are 30” wide and 60” high, printed in full color on 18 oz. block out vinyl material. Cost of sponsorship for families, individuals, civic organizations and businesses is $150.00. Application are available at the Marple Township office, 227 S. Sproul Road, Broomall or online at www.broomallrotary.com and www.marpletwp.com. Applications can be submitted in person at the Marple Township office and will be processed with a fully completed application form, a photo of the veteran or active duty personnel in uniform, a photocopy of a separation document or Military ID card (front and back) and a check or money order made payable to the Broomall Rotary Club. 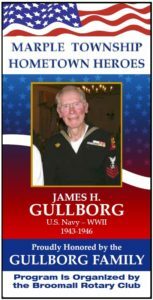 Businesses or Civic Organizations may sponsor a banner for a particular veteran and their name will appear as the sponsor. Placement of the banners will be at the sole discretion of the Broomall Rotary Club. Contributions to the program will be greatly appreciated. If you have any questions, please contact Rotarian Bill Brower at wbrower1@verizon.net or 610-356-1604. © 2019 Broomall Rotary Club. All rights reserved.